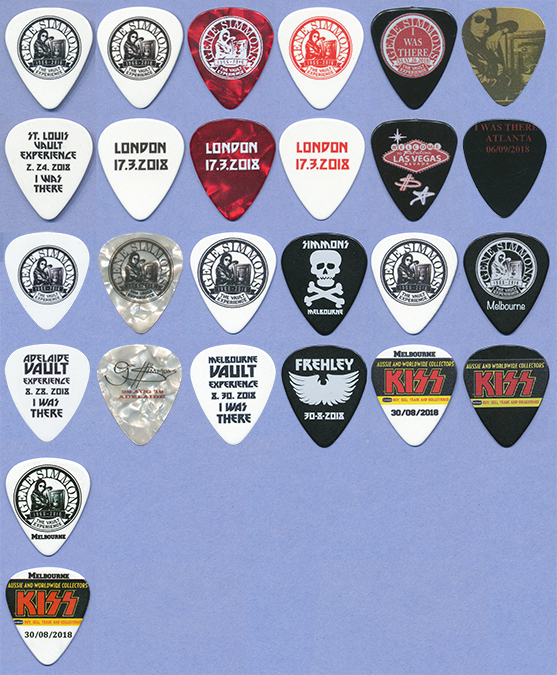 A pictured reference guide to various KISS related novelty guitar picks. 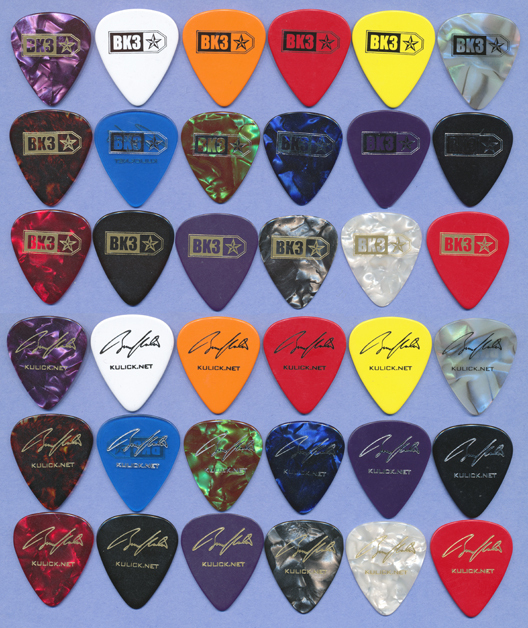 These are picks that were not produced for any sort of touring. They generally are produced as giveaways or specifically for the purpose of sale to the general public in some fashion. 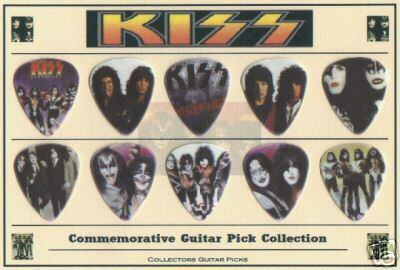 I have not yet collected a lot of these myself, but I am interested in obtaining picks I do not have. Descriptions in this color green are ones I do not have. Note: Table favors at Bruce's wedding reception. 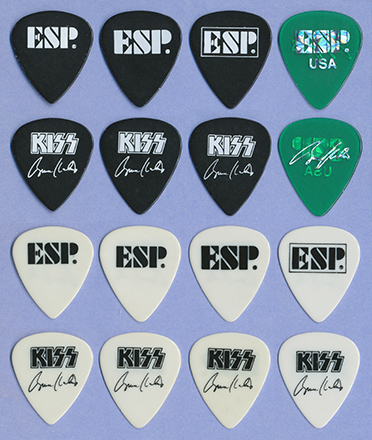 ESP-BK9 - transparent green with silver prism logo & sig / ESP This one has an interesting story: This was actually supposed to be for the band ESP (Eric Singer Project). 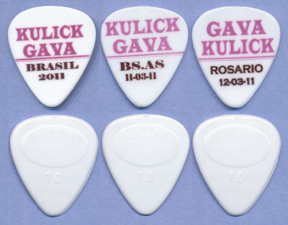 But the pick company used the Electronic Sounds Products logo. 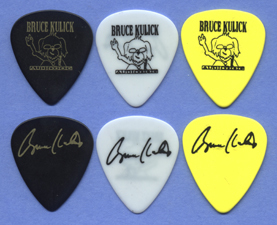 Since Bruce endorses their guitars, they allowed him to have the picks rather than destroying them. Notes: There are unconfirmed rumors of a white on purple pick. If you look closely, the US versions have a slightly different E. Electrovoice in Japan actually has a copyright on the speaker in the E, so the E had to be modified for the US versions of the pick. 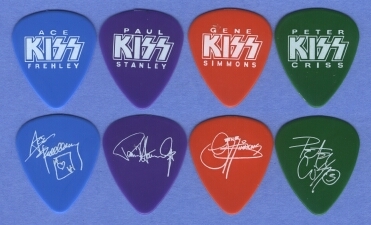 Creative Communication sold KISS phone cards (for only $10) that came with these picks. Gene and company gave them permission. Most of them do not have a dash (-) between the 96 and 97, however some do. Where known, I will try to list them with or w/out the dash. 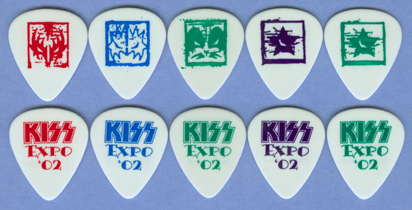 With the success of the Creative Communication/ KISS phone cards, a metallic set in each of the characters' colors was made and sold at various expos. As they ran out of stock, new versions were made with slightly different variations. 12P-AF3 - gold on red - RARE!! Note: This list is likely not complete. 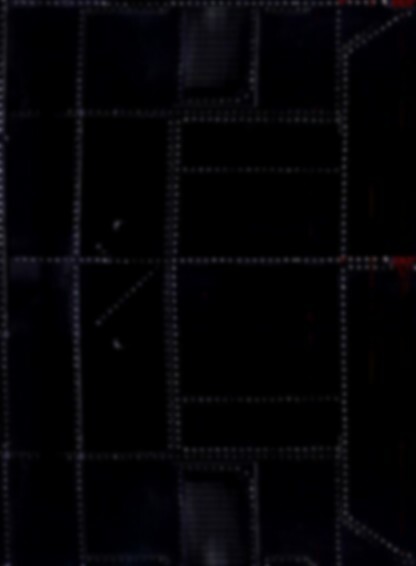 A fairly wide variety of color combinations have been reported. I will continue to add to it as I uncover visual evidence. 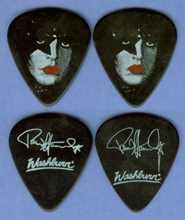 WASHPRO-PS1 - prototype - Paul's picture / sig & Washburn - black w/ white print and red lips w/ no line and smaller sig than actual promo - Very Rare!! LES-AF1 - promo pick - Ace's picture (smaller face) / Gibson USA black w/ silver print. Heavy gauge. Only available in the Ace Frehley power pack you could get directly from Gibson after purchasing the Ace Frehley Les Paul guitar. Came 3 in the pack. 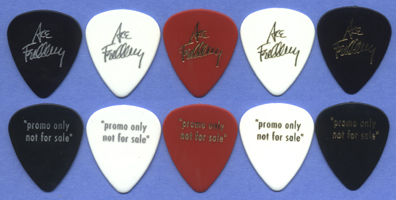 LES-AF2 - promo pick - Ace's picture (smaller face) / Gibson USA black w/ silver print. Medium gauge. Only available in the Ace Frehley power pack you could get directly from Gibson after purchasing the Ace Frehley Les Paul guitar. 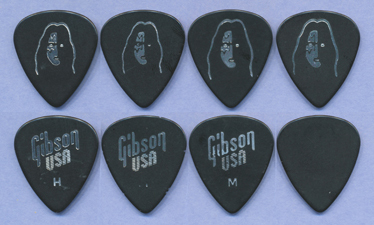 LES-AF3 - promo pick - Ace's picture (smaller face) / Gibson USA black w/ silver print. Only a small dot for the gauge. Possibly a misprint? 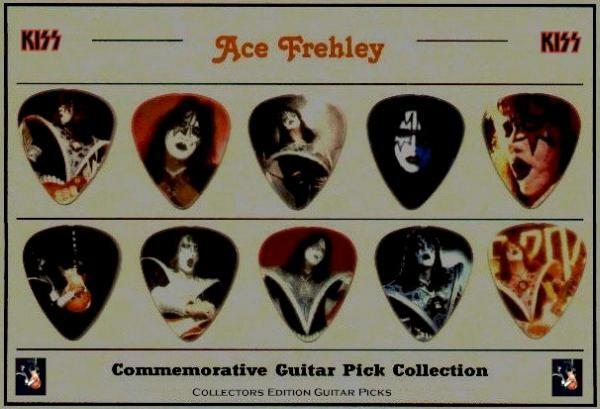 Only available in the Ace Frehley power pack you could get directly from Gibson after purchasing the Ace Frehley Les Paul guitar. 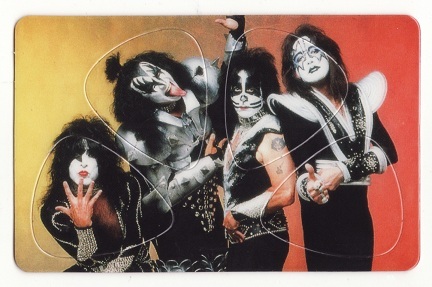 LES-AF4 - promo pick - Ace's picture (larger face) / Gibson USA black w/ silver print. Medium gauge. Only available in the Ace Frehley power pack you could get directly from Gibson after purchasing the Ace Frehley Les Paul guitar. LES-AF5 - promo pick - Ace's picture (larger face) / blank on back. Medium gauge. 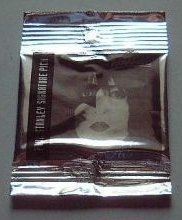 Only available in the Ace Frehley power pack you could get directly from Gibson after purchasing the Ace Frehley Les Paul guitar. LES-AF6 - promo pick - Ace's picture / Gibson USA tortoise w/ gold print. Larger face. Has different Gibson logo on back. Note: Music From the Folder, Creatures of the Net - A New Millennium and The Spirit of '78 were tribute CD's produced by MusiCare Online and 100% of the proceeds were donated to various charities. NECA-AF - white on light blue - logo/ Spencer's style sig. NECA-PS - white on purple - logo/ Spencer's style sig. NECA-GS - white on red - logo/ Spencer's style sig. NECA-PC - white on green - logo/ Spencer's style sig. KFRK1 - white on black - prototype pick. Only 2 were ever made! 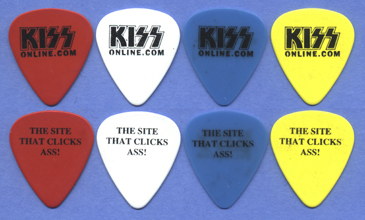 Note: Cool KISS-related website which has since evolved into the modern day KissArmyWarehouse.com. Note: These come in two varieties. The earliest sets did not have names; The later sets did. I don't know a whole lot about these yet, other than they are UNOFFICIAL and made in China. MSJ1 - black on white - one line sig. - Mark had these made to give away at his fan expo appearances. 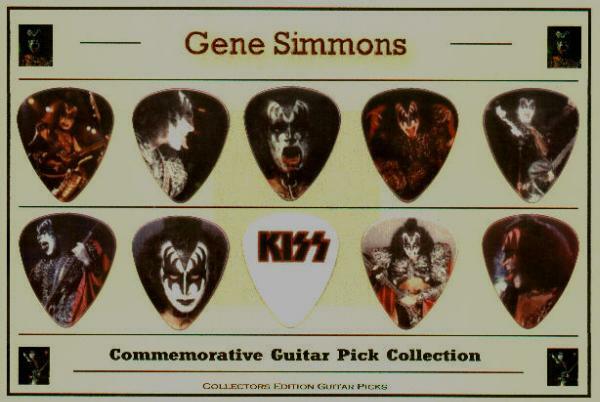 These are what his Animalize picks would have looked like if he did not incur the Reuter's Syndrome. 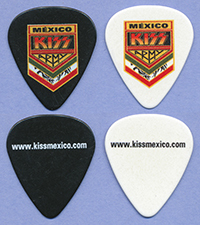 Unlike real Animalize tour picks, these promos are pad printed not stamped. MSJ2 - black on white - two line sig. -Mark had these made to give away at his fan expo appearances. 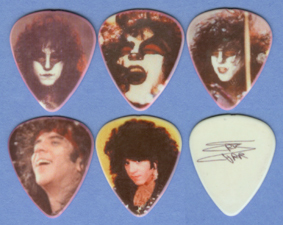 These are what his Animalize picks would have looked like if he did not incur the Reuter's Syndrome. 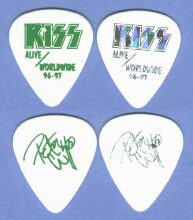 Unlike real Animalize tour picks, these promos are pad printed not stamped. 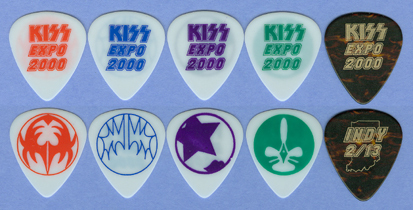 Note: All 5 of these exist in both solid white and semi-transparent white picks. DCH1 - silver on black - given away to all attendees by Dark Horse Comics at the Comic Con International 2002 comic book convention in San Diego from August 1-4, 2002. 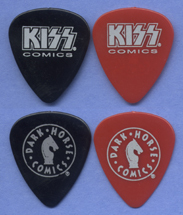 DCH2 - silver on red - limited edition given away by Dark Horse Comics only to the 150 people who won the wrist band lottery for the Gene Simmons autograph signing on August 3, 2002. 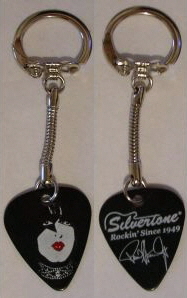 Note: Made as giveaway for the 2003 NAMM Convention, these most often were seen attached to a keychain like the photo at right. ECC6 - Photo pick of the oil painting of Eric in the likeness of the 1978 solo albums. 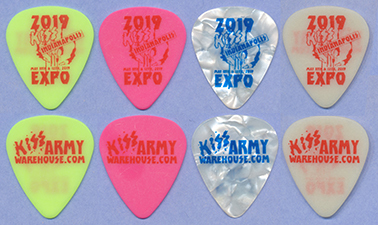 Note: There were other picks made for this expo for other guests, promoters, etc., but I am only cataloging the Bruce & Eric picks for this site's purposes. Note: Two entrepreneurs in Melbourne, Australia attempted to bring the world a KISS megastore. 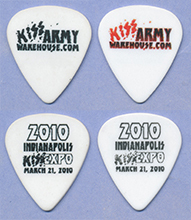 They manufactured about 2 gross of picks in December, 2004 to commemorate KissWorld. Unfortunately, a variety of complications prevented the physical store from opening, but exclusive items are still available through their website. 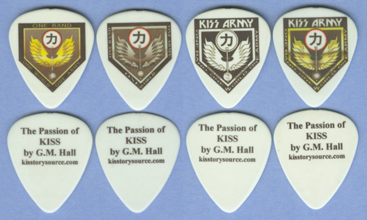 Note: Promotional giveaways to support a proposed unofficial book about the KISS Army that never got off the ground. 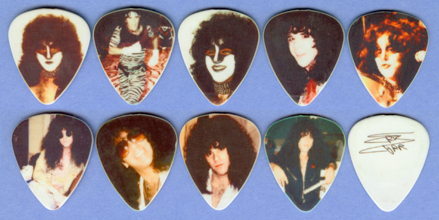 ECL1 - ECL5 - Five pick set of photo picks issued by the family of Eric Carr. Limited edition of 300 sets. As with the 2000 series, I don't know a whole lot about these yet, other than they are made in China and UNOFFICIAL. 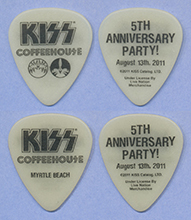 Given out to fans on June 27, 2006 who went through line to meet Gene and Paul at the Grand Opening of the first KISS coffeehouse in Myrtle Beach, SC . Included in the limited edition signed Paul PS80 type guitars (3 per guitar) sold exclusively through Target stores. MSJ1 - silver on black - two line sig. MSJ2 - white on tortoise - two line sig. Note: Mark had these made to give away at his fan expo appearances. 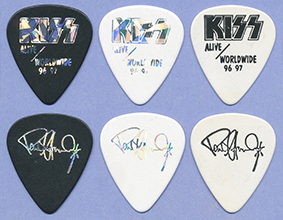 Note: Promotional picks given as part of the official KISS Army fan club membership kit. 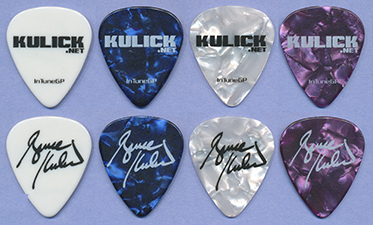 Note: Promotional picks put out by Bruce Kulick to support his KKB CD release. Note: Officially licensed promotional picks put out by C&D Visionary, Inc. 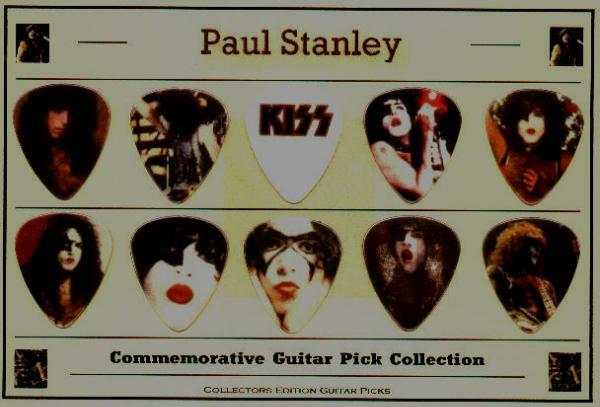 Note: Promotional picks put out to support Paul's "One Live KISS" DVD at pre-release screenings.. 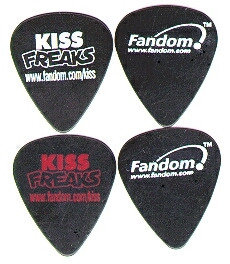 Note: Promotional picks mailed out to official KISS Army Fanclub members as part of the membership kit. 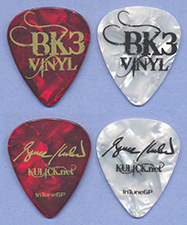 Note: Promotional picks put out by Bruce Kulick to support his BK3 CD release. 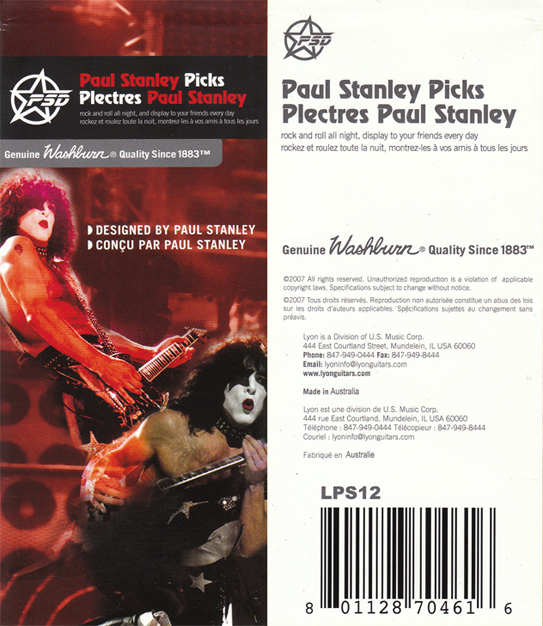 Note: Included in the the compilation CD "KISS - Playlist Your Way"
Included in the Paul Stanley signature line of guitars. The semi-transparent white came with the PS9 and PS400. The pearl white came with the PS11 and other PS400 models. 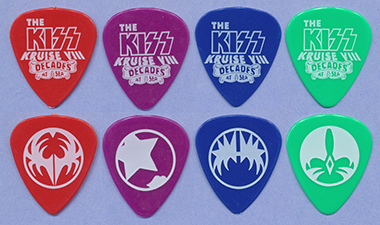 Interesting differences in KISS logos! 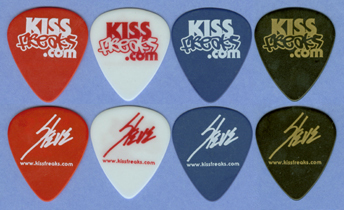 Note: Promotional picks that could be purchased with Swag Bucks earned by the Search With KISS toolbar. 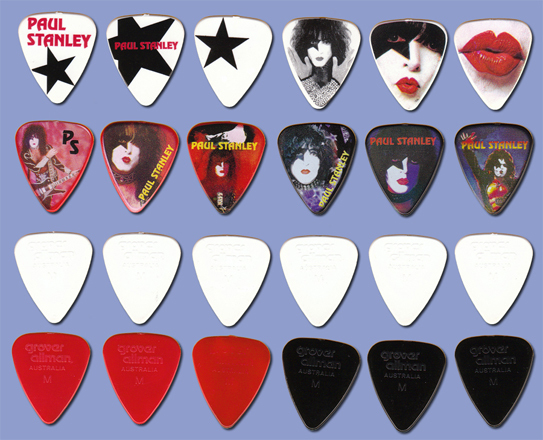 Included in the Paul Stanley Flying V guitar. Each set sold in packs of 10 (2 sets per pack) and made in light, medium and heavy gauges. 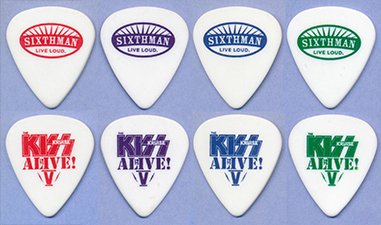 Re-prints of 2009 Alive 35 picks with metallic red signatures. 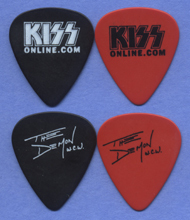 The 2009 tour used picks had plain red signatures and only Paul & Tommy had them. Included in photo/pick pack. An homage to his "Lightning Strikes" song on Sonic Boom. Bruce played a couple of dates on March 11th in Buenos Aires and March 12th in Rosario with his friend Sebastian Gava. They played songs from each of their respective solo albums and some KISS classics. 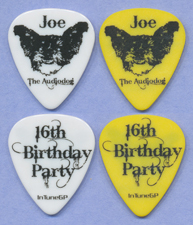 Bruce had very limited quantity special picks made to celebrate the Sweet 16th birthday of the one and only, "Joe the Audiodog". 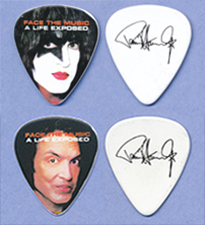 Due to overwhelming popularity, the extras were sold with part of the proceeds from each sale donated to the Pet Adoption Fund in California, where Bruce adopted Joe. 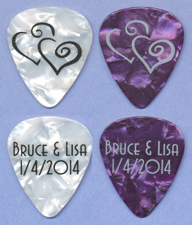 These were available as merchandise online following the wedding. No confirmation whether or not they were actually given out at the wedding inception. 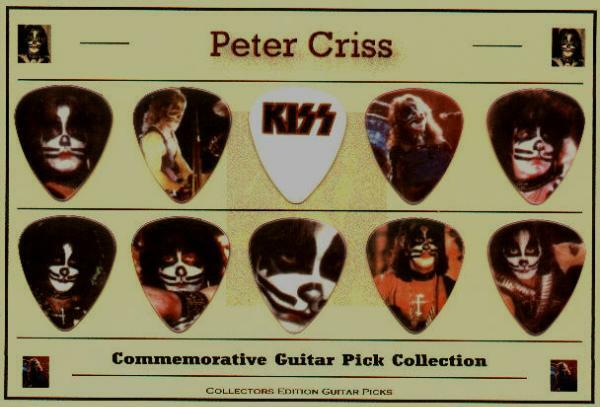 Promotional picks to celebrate the release of the "Eric Carr Unfinished Business" CD. 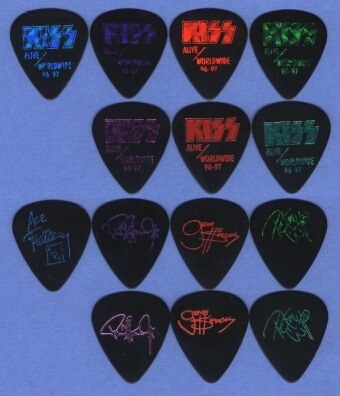 These are available at the gift shop and online store for the KISS by Monster Mini Golf facility in Las Vegas. 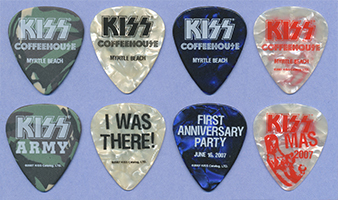 These were available at the gift shop for the 1st Anniversary party at KISS by Monster Mini Golf facility in Las Vegas. 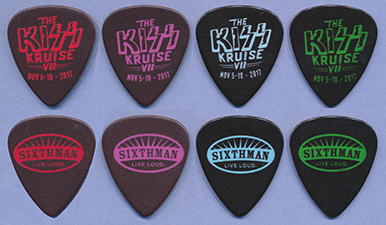 These were given out by promoter Sixthman LTD as Kruisers disembarked the ship. Given out at first LA KISS home game. 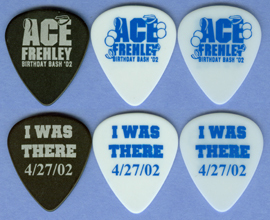 These seem to have been printed in large sheets and then punched out vs. individually printed on pre-formed picks. Given out at Paul's first few book signings. 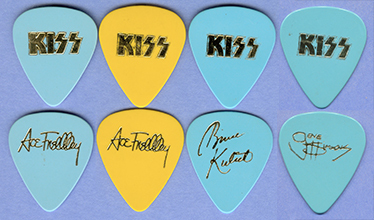 First 25,000 copies came with an Ace Frehley signature pick. 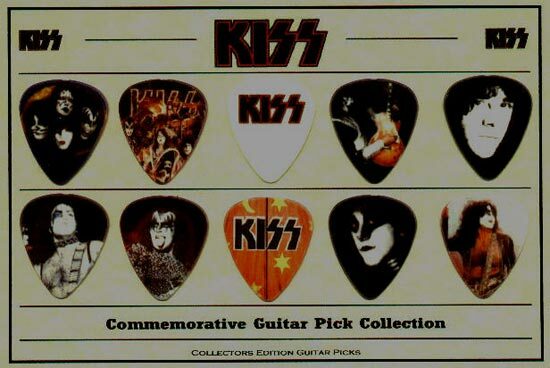 Included in the Bruce Kulick model guitar. Included with BK3 vinyl album. Included in the KKB "Got to Get Back" CD. to a specific band or product. promoter Sixthman LTD as kruisers disembarked the ship. The Board Member and Shareholder picks are limited to 100 each and given to those members at their annual board meeting. 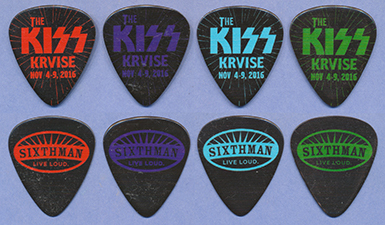 The last two were given out at the KISSmas event on December 3, 2106. 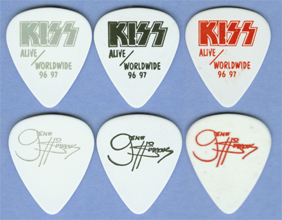 These were predominantly sold online and at the merch booths, but Gene has thrown some from the stage during the shows as well. promoter Sixthman LTD as kruisers completed their band photo. These were packaged with full and miniature replicas of his banana ESP M-1 guitar featured in the recording and album artwork for Crazy Nights. These were included in a deluxe package of the colored vinyl reissue of "Anomaly" through PledgeMusic in December, 2017. 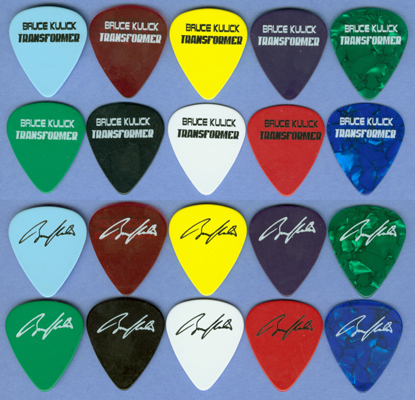 Fan designed pick after his famous Radioactive suit from the tour. Sold as part of a pick pack along with a stage photo in that suit. 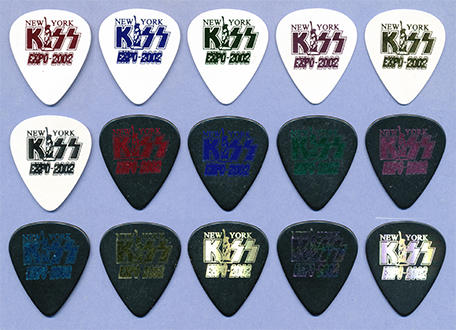 All fan designed picks, so unofficial, but still pretty cool! 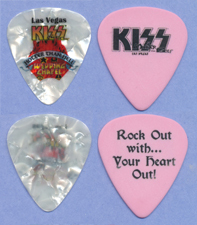 These were handed out during a release party at Las Vegas KISS Monster Mini Golf. promoter Sixthman LTD as kruisers completed their stage photo. Included with BK3 limited edition 180-gram, red vinyl reissue. 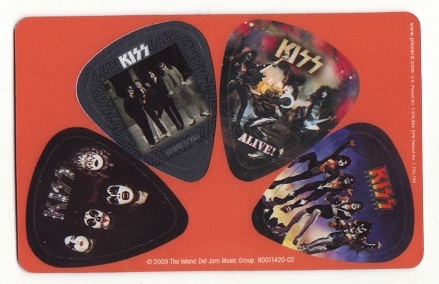 First 150 sold received this pick with the album. 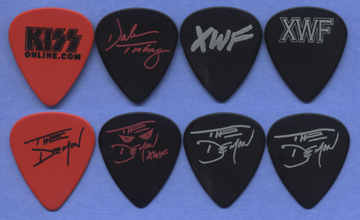 If you have photos of these sets, including front and back, or know of additional picks not shown here, please email me. Please contact me if you have any of the ones I need! All text and photos posted on this page are the sole property of Ken Rodenas. Any copying, reproduction or use of these texts or images w/out the express written consent of Ken Rodenas is strictly prohibited. This unofficial, fan based, non-profit site is not associated with KISS Corp. or Live Nation in any way.